Professor Raymond C. Bice with his pseudophone, no date. 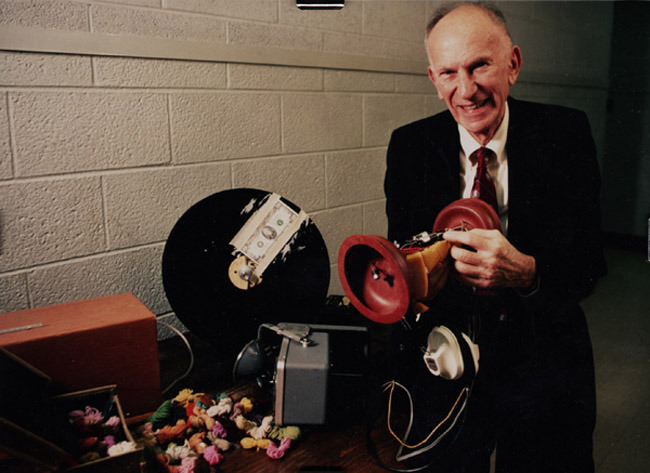 Over the years, beloved Professor Emeritus of Psychology Raymond C. Bice devised many inventions which came to be known as "Bice Devices." Mr. Bice invented the pseudophone (shown in the photo) to test sound localization--"or what would happen if you could place your right ear on the left side of your head." Believing that "a demonstration is worth a thousand words" and "learning is supposed to be fun," "Doc" Bice entertained over 27,000 students during his 46 years of teaching "Bice Psych," his celebrated Psychology 101 course.